1. Changing it up, I’m going to start with the pretty music first. This is one of my favorite pieces of music – it’s like heroin except without the whole “dissolving your teeth out of your head” part. I warn you, once you go here, it will live forever in your mind. This is an instrumental bluegrass cover/arrangement of (stay with me) Jimmy Buffet’s “A Pirate Looks at 40”. I have always appreciated the MELODY of APLA40, but, obviously, loathed the whole Jimmy Buffet wallowing in stoner-drunk-loserdom thing, and always thought it would be cool to re-lyric the melody. Well, lyrics schmiricks. If you have a pretty melody, JUST. GO. INSTRUMENTAL. And if you’re really awesome, get a mandolin involved. And it just showed up on YouTube. Here ya go. It is best turned up loud, or with good headphones. Saint Raymond accompanied the King of Aragon on an expedition to Majorca and boldly rebuked him there for giving public scandal. However, finding that his rebuke had no effect on the King, Saint Raymond prepared to return to Barcelona. The King attempted to keep Saint Raymond on the island by force, but Saint Raymond flung his mantle into the sea fastened to the end of his staff, serving as a mast, and sailed on his mantle, like a boat, the nearly 100 miles back to the mainland. 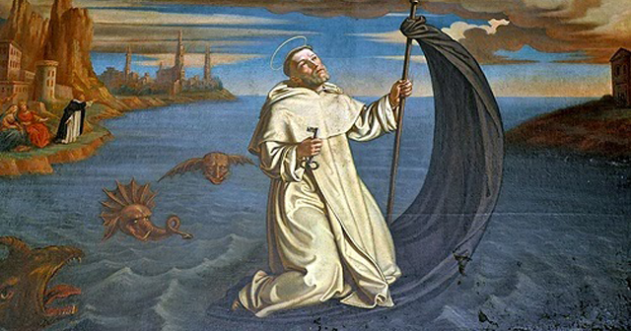 On reaching Barcelona, Saint Raymond took up his mantle, which was perfectly dry, and was transported through the locked doors of the convent and beyond the acclamations of the crowd that witnessed his landing. Touched by the miracle, the King of Aragon thereafter renounced his evil ways and led a good life. 5. A bit of housekeeping on the YouTube front. Yes, YouTube scrubbed my ARSH 2011 “Islamic Sexuality: A Survey of Evil” video series from MY YouTube account, which is why I strongly encourage and appreciate other people MIRRORING my YouTube stuff. Mirroring is the ultimate hedge against censorship. I don’t care about my own personal view count – none of my vids are monetized. I just want the info out there. That’s the point. So, here it is in one video. There are countless mirrors though if you type “Ann Barnhardt Islamic Sexuality” into the YouTube search box. This entry was posted in Uncategorized on January 22, ARSH 2015 by Ann Barnhardt.